LNG Simulation training in progress at MSI. Despite its unquestionable allure, LNG as a fuel carries with it as many risks as it does answers to the problems it promises to solve. As industry and OEM’s work to remove any doubt, the collaborative effort outpaces the slow-moving regulatory machine. Even as Lloyds Register predicts that LNG will reach a maximum 11% share of marine propulsion solutions in 2030, it also says that segments with higher proportion of small ships will see the highest LNG uptake. And, at the same time, says the global classification society in its recent paper entitled, Global Marine Fuel Trends 2030, the marine fuel mix for bulk, containers and tankers by 2030 can be defined by two words: “decreasingly conventional.” Global Marine Fuel Trends 2030 examines the landscape of fuels likely to be used by commercial shipping over the next 16 years. One of those fuels will no doubt be LNG. But, there will be others, as well. The LNG movement, here and abroad, built in part on the premise of “if you build it, they will come” has been somewhat deflated of late, and not just because Shell decided that they would move more cautiously in this arena. LNG’s primary drivers of the environment – namely the North American ECA Requirements and the potential economic benefit of low priced LNG in region – are now being weighed against price uncertainties brought on by the rush to export, the premium cost of installing dual fuel engines, the delivery system itself (as much as $12 million for LNG tanks, compressors, refrigeration, double wall piping and distribution valves), the cost of infrastructure to support bunkering and logistics and the possibilities of other fuels, methanol, for example, being added to the mix. In the meantime, those who have taken the plunge into the LNG arena are not sitting on their collective hands. Original Equipment Manufacturers (OEM), classification societies, the IMO and the United States Coast Guard are all weighing in and taking measures to ensure that when LNG does hit the water in North America, safety and training standards will be robust enough to ensure that LNG as propulsion will be every bit as safe as the exemplary record that LNG ocean transport has enjoyed for decades. And, it is here where gray areas remain. LNG as a fuel is not new. Employed for more than a decade as fuel, primarily in the North Sea in the OSV trades, these LNG powered vessels have enjoyed very good reliability in operation and like LNG transport vessels, an excellent safety record. As North America ramps up to try and repeat on that enviable record, and with no real experience in the dual fuel / LNG propulsion arena, there are also no rules with regard to training and competencies for the mariners who will very soon – MarPro sources say as early as September 2014 – have to operate those vessels. Absent those rules, industry, operators and the OEM’s are forging ahead. The existing guidance from the United States Coast Guard (Policy Letter 02-12 – Equivalency Determination Design Criteria for Gas Fuel Systems) and based upon IMO Resolution MSC 285.86, establishes design and safety criteria for gas fuel systems. These rules involve design only and do not apply to training, credentialing or operations. 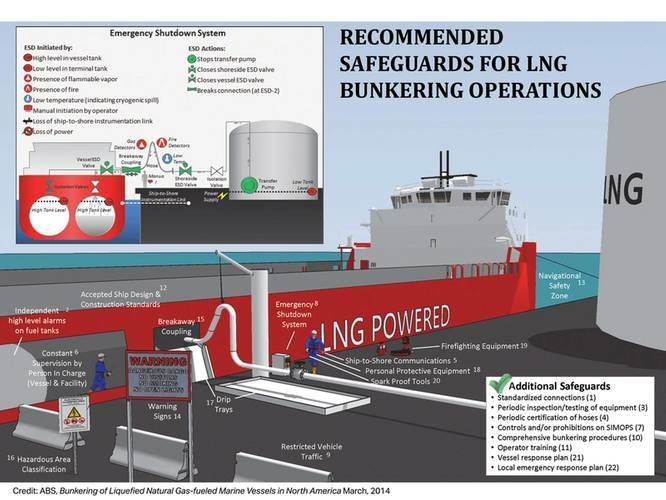 According to a recent ABS report entitled, “Bunkering of Liquid Natural Gas-fueled Marine Vessels in North America,” the USCG is developing two operating policies for LNG fuel transfer operations and training of personnel on vessels that use natural gas as fuel. The first draft operations policy letter provides voluntary guidance for LNG fuel transfer operations on vessels using natural gas as fuel in U.S. waters, and training of personnel on those vessels. The document further recommends transfer and personnel training measures that the USCG believes will achieve a level of safety that is at least equivalent to that provided for traditional fueled vessels. It would apply to vessels equipped to receive LNG for use as fuel, but not to vessels carrying LNG as cargo that use boil-off gas as fuel. The finalized policies will serve as guidance for the USCG Captains of the Port (COTPs) and guidelines for fuel transfer operations and training of personnel working on U.S. and foreign vessels that (a.) use natural gas as a fuel and (b.) conduct fuel transfer operations in U.S. waters. Similar gaps exist in the rules that are already in place. At an April meeting of the Merchant Merchant Marine Personnel Advisory Committee (MERPAC), a review of the applicability of the STCW 2015 Amendments about Training of Ship’s Personnel on board Small, Domestic Vessels using Alternative Marine Fuels was undertaken. For example, the applicability of the IGF Code and training for vessels using fuels subject to the IGF code is for vessels greater than 500 Tons. But, as MERPAC personnel noted, there are likely to be vessels of less than 500 tons that will be using such fuels in the future. It is the position of MERPAC that personnel serving aboard such vessels should be subject to similar training requirements. MERPAC’s purpose is to advise the Secretary of the Department of Homeland Security (DHS), via the Commandant, U.S. Coast Guard, on matters relating to the training, qualification, licensing, certification and fitness of seamen in the merchant marine. And, using this very philosophy, industry is moving forward with the training necessary to operate that equipment. 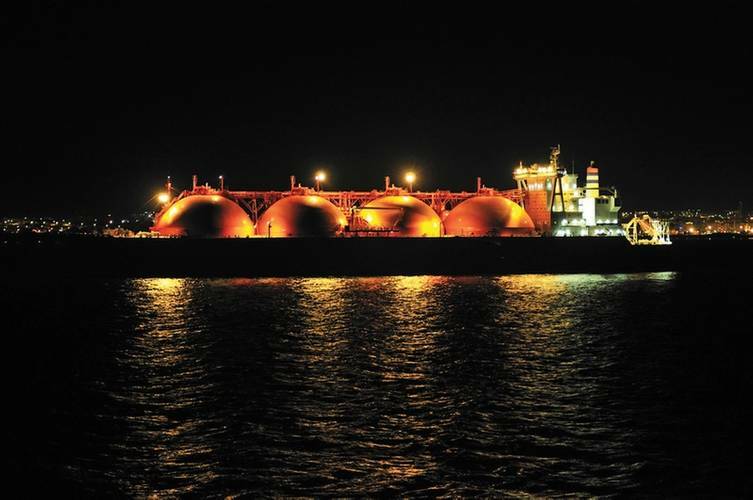 LNG bunkering, according to the ABS report, can take the form of three basic options. Option 1 involves delivery from a terminal storage tank directly to the vessel, via fixed hoses and cranes or dedicated bunkering arms. A second option might involve use of a tank truck which would arrive at a prearranged transfer location and provide hoses that are connected to the truck and to the vessel moored at a dock. Another method could involve an LNG bunkering barge to come alongside the ship, allowing cargo to be loaded and the vessel to be fueled at the same time, much the same way standard bunkering is done today in many ports. Answering the need for training in the critical area of LNG bunkering is Middletown, R.I.-based Maritime Simulation Institute (MSI). MSI is developing an LNG bunkering safety training course for Harvey Gulf International Marine as the Gulf Coast offshore support operator prepares to launch its first dual fuel offshore supply vessel. The Harvey Energy is the first of at least six such Wärtsilä 34DF-powered ships and will run primarily on liquefied natural gas and if Harvey Gulf CEO Shane Guidry has his way, that’s the only fuel that will see the inside of his new dual fuel engines. But, before that can happen, his crews have to come up to speed on something that’s never been tried under U.S. flag, or in U.S. waters. The first session, which is expected to begin in June, will be given exclusively for New Orleans-based Harvey Gulf International Marine. MSI’s Wärtsilä-designed simulation system is based upon Wärtsilä’s equipment and operations stations, with a software/operator interface. The simulation will mimic a myriad of possible outcomes and emergencies, with the operating system, tank monitoring, pressure and temperature alarms all part of the mix. Starting in mid-June, Wärtsilä will also provide training for Harvey Gulf’s engineers in their Florida location, where they have run dual fuel/gas engine training to a wide range of users for the past decade. The 45-hour bunkering course for Harvey’s LNG bunkering persons-in-charge (PIC) will be offered ahead of any U.S. Coast Guard regulations governing LNG bunkering. Beyond Doyle’s qualifications and industry participation, MSI itself has extensive experience in full-featured tugboat operations teaching and is applying its simulator expertise to LNG bunkering. As MSI prepares to roll out its version of LNG Bunkering Training – the first such offering in the United States – course content will be developed on the dual-fuel propulsion system and the Harvey Gulf International Marine vessel and terminal designs. Eventually, the course will be ABS and DNV GL certified – both organizations are coming in June to ‘vet’ the course. 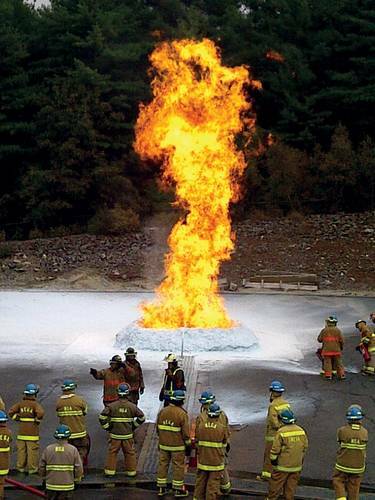 In a unique arrangement that involves a partnership between engine OEM Wärtsilä, Harvey Gulf International, and the Massachusetts Firefighting Academy, course participants will also get the benefit of fighting LNG fires at one of the few institutions set up to do so. And, it was this 1-2 punch that was so attractive to Harvey Gulf, says Harvey Gulf’s Executive Vice President Alaska & LNG Operations, Chad Verret. Probably no one has more to lose if things do not go right than Harvey Gulf International Marine. The leader and also first out of the gate in terms of LNG as a fuel in North America, they also have an enviable safety track record to protect and build upon. According to Harvey Gulf’s Chad Verret, the decision to choose MSI for this first-of-a-kind training was not made lightly. But MSI, in business since 1981, also has deep roots in simulator knowhow and will leverage that in its new LNG bunkering offering. Indeed, MSI’s client list already reads like a ‘who’s-who’ of marine LNG operators and stakeholders. Verret told MarPro in May that there would be no corners cut on the way to a safe and fully compliant dual fuel operation for his firm. “Every person that needs to respond to an emergency – on some boats, that might mean a cook, on others, it might not – will get this training.” He added, “We’ll have 6 vessels involving 9 to 10 crews, plus safety and certain office/shore personnel. It’ll eventually involve over 100 people.” Also according to Verret, the course adheres to recommendations from IMO and the U.S. Coast Guard, is designed to provide competencies and employs a proprietary Wärtsilä designed simulation system. “As things evolve even further, we will ramp up to meet those requirements,” he said. The American Bureau of Shipping says that “There is a need in the maritime industry for guidance when considering the adoption of LNG as a fuel or supplying fuel to the marine market.” The global classification society, as much as any other, has been busy doing just that. But, with LNG and/or dual fueled vessels already in the water and still others on the backlogs of U.S. shipyards, the need to quantify that advice for early adopters is paramount. And, unlike the conundrum presented to operators trying to decide when, where and what kind of ballast water treatment systems to install ahead of final approvals and alignment of global, federal and state regulations, LNG as a marine fuel is already here. Fortunately, the training necessary to ensure that the rollout goes smoothly in North American waters is also here. Being first with dual fuel engines, the North American vessels that employ that technology and the training that defines how they will be operated carries with it a measure of risk. There is virtually no room for error as the age of dual fuel and LNG propulsion kicks off on this side of the pond. MSI’s LNG Bunkering training course, the product of industry collaboration – OEM’s, vessel operators and an experienced training center – and based exclusively on existing, available regulatory guidance, is just one more example of where maritime stakeholders are at the spearhead of efforts to ensure a safer waterfront.